This is Brevin, little brother of McKenna and second baby for Kelsey and Patrick. Patrick teaches history at my neighborhood middle school. 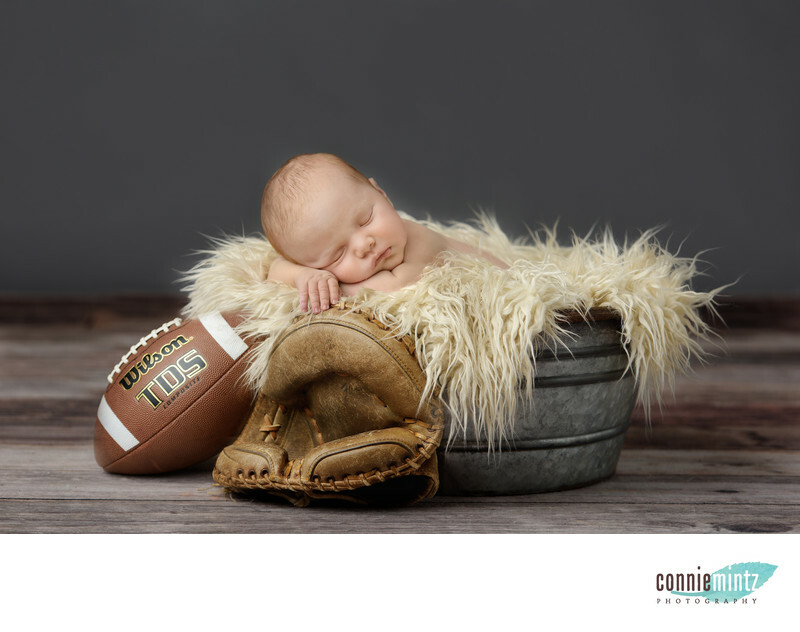 I am always honored when teachers choose Connie Mintz Photography for their newborn session. Since Brevin was three weeks old at his newborn session, it took a little longer to get him into a deep sleep. Just as we were about to end the day, he fell into a deep sleep. I quickly broke down the set that was currently up and got ready. Dad is a huge sport fan and brought a baseball mitt and football hoping to get Brevin posed with them. The mit has been in Patrick's family for a long time. I want to say it was his grandfathers baseball mitt. I really like the neutral gray background and the wooden floors. I think this image really works and I's so happy that we took the opportunity at the end of the session to get this shot. I'm sure dad will be thrilled!Keywords: baby (45), baseball (6), boy (30), football (6), gray (36), newborn (123), Siblings (15), studio (78). 1/200; f/3.5; ISO 100; 145.0 mm.